In an age where Need for Speed had a new game coming out every ten minutes, and Burnout was still the king of the high-speed hill, Black Rock Studios strove to do something else, something different. Enter Split/Second, a wild and welcomed departure from the usual racing game formula. Split/Second is centered around the premise that you’re in a reality TV show. And hell, there’s one for pawn shops and one for children’s beauty pageants, so why not? On “Split/Second”, racers are vying to make it to the finish line, not only to win the race, but just to survive. While the game’s narrative really goes no deeper than that (and seriously, what do you expect in a racing game? ), the entire game’s mechanics center around those two ideas: racing and destruction. You see, Split/Second has it’s own rules, what I call the Five D’s of racing: dodging hazards, drifting, drafting, destroying, and, uh, dodging more hazards (among other things). Doing these builds up your Power Meter, which allows you the ability to call down obstacles and disasters to “wreck” your opponents. Essentially it takes Burnout’s philosophy to destroy your opponents, fuses it with a Michael Bay film, gives it steroids, and feeds it nothing but beef covered in Jack Daniels sauce. The result is an insane, adrenaline-fueled racing experience that’s as intense and tactical as it is fun (and occasionally frustrating). 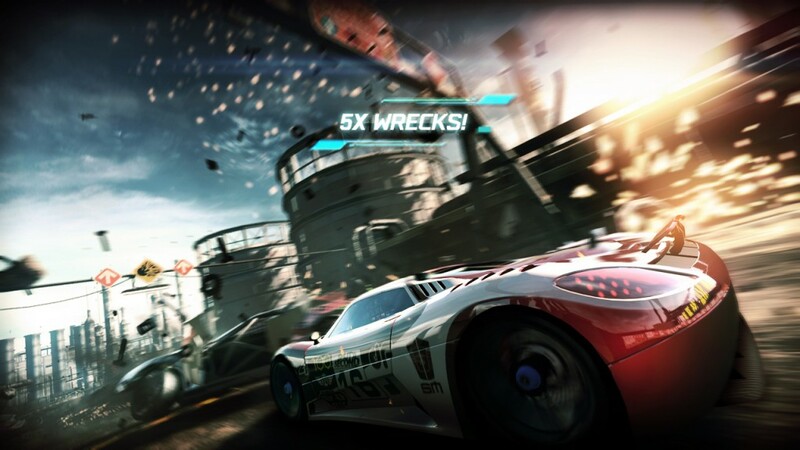 Split/Second offers various racing types, which can be enjoyed in the both the Single Player’s Career mode and Quick Match mode, or in Multiplayer via Online or Split-Screen (note: a game with “split” in the title has to have split-screen in it). Career Mode is where players will get the meat of their experience, progressing through the game via twelve “Episodes” that pit you against up to seven rivals across six races. As you play, earning 1st, 2nd, or 3rd place nets players points that unlock newer cars. Episodes also require a certain amount of points or wrecks (wrecks are how many times players destroy a rival during a race) that can unlock special hidden challenges and the mandatory Elite Race that finishes an Episode. As you can imagine, Elite Races are the hardest, most brutal races you’ll face, pitting you against much stronger A.I. driving much stronger cars, where a single mistake could cost you the race. Once an Episode is complete, players are allowed to choose which of the two following Episodes to try next, giving a mild form of player choice. Also, each race can be replayed for a higher rank, so if a race is too hard to win 1st place on earlier in the game, wait for a better car and try, try again. But be warned: the races can be challenging. Very challenging. It may take a race or two to become accustomed to Split/Second’s mechanics, and many players may be used to the option of boosting/nitrous, which is absent here. But given a short amount of time, Split/Second becomes natural, even intuitive, drawing on instinct as much as skill to achieve victory. Drafting behind rivals, drifting around corners, weaving between cars and obstacles, all of it is smooth. The biggest challenge usually comes not in the controls, but getting accustomed to the newer cars, and trying to outsmart the enemy A.I. The obstacles are by far the biggest draw of the game. While some stages feel empty or less inspired, it’s only because there is so much detail and options available in others. The tamer stages simply can’t compare to the more adrenaline-fueled, win-by-a-hair races available, and this lack of equality makes those lesser stages suffer. Obstacles and hazards can range from something as mild as helicopters dropping small bombs, to medium dangers like exploding cars and trucks, to insane dangers like collapsing buildings, bridges, and even entire planes falling from the sky directly at your car. Yes, it’s incredible. Incredibly awesome. And that’s not the end of it. There are stages with “Change Course” hazards that can alter the terrain before you as you play, radically changing the geography of the map so much within one race that it will feel like a much different stage by the end. To see the roads crumble under your rivals and swallow them up is amazing: to radically alter the stage and create your own shortcut is awesome. The only disappointment with hazards is that these obstacles are location based: you can’t just bring down a plane anywhere on any map. But while this inevitably leads to the the memorization of hazards (and presumably taking away the notion of unpredictability), Split/Second still carries a high amount of tension as anticipation builds. It’s like when you know something bad is coming, and it’s not the what or the how, but the when. Is my rival going to get me here where the bus explodes? Or here where the cruiseship sinks? This tension either makes or breaks a good racer, with hard nerves, good reflexes, and quick thinking encouraging the most strategic gaming played in a racing game in a long time. Other modes, like Survival, have you trying to pass huge Terminator 2-inspired trucks as barrels of explosives fall off the back trying to destroy you. Another mode, Air Strike, is a another “Survival Mode” that has a helicopter shooting missiles at you as you struggle to survive. Another mode, Detonator, puts you into a time trial stage where all the hazards are active and set off remotely, forcing players to beat the clock without getting wrecked. The variety adds just enough tweaks to Split/Second’s formula to keep things interest in the game strong, actually giving you a reason to play something besides the Career mode. But despite all of this, Split/Second does have its flaws. The hazards and the cars can make for a frustrating pair, with some cars that wreck far too easily under the slightest provocation. The aforementioned enemy A.I. can randomly go from simply competent to frustratingly difficult even on regular difficulty, causing the occasional controlling-throwing tantrum. For example, during the final race of the game, I survived all three laps without getting wrecked, while also wrecking all of my rivals at least once (some even several times, I kept count) only to have a previously (much) wrecked enemy pass me at the very last second to (impossibly) take the win. Yes, we know the title of the game is “Split/Second”, but allowing the A.I. to magically win a well-played game only punishes the most enthusiastic and devoted players. 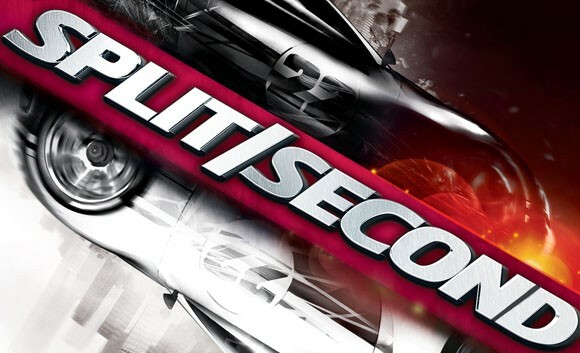 But even with the occasional difficulty spike, Split/Second is a game that brings so much to the racing genre that it stands out amongst its peers for what it strives for and accomplishes. It’s disappointing that the development team—Black Rock Studio—have since been disbanded by internal decisions by their publisher, Disney Interactive Studio, and so a Split/Second 2 is highly unlikely. Still, this game is such a testimony to creativity and innovation (in a field whose typical creative innovation is just newer licensed cars and weather effects) that it stands incredibly well on its own and will hopefully inspire other games like it in the future. Do yourself a favor: buy this game, enjoy it, and share it with your friends. Then find me online so we can race together. Amen to that brother. Sequels nowadays can either be rarely awesome and innovative, or sadly and generally a one-note difference from their predecessors (especially the annual ones). But Split/Second was a true gem from a newish studio trying something really different, and sadly the industry doesn’t always reward the true trailblazers that try to do something new and creative.